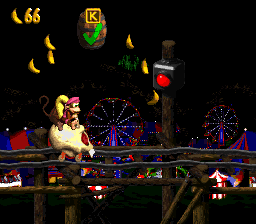 Target Terror is the eighteenth level of Donkey Kong Country 2: Diddy's Kong Quest. It is also the second area of Krazy Kremland. 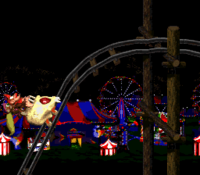 This level is the first roller coaster level in the game, and it involves Diddy and Dixie Kong riding in a Roller Coaster. Check and X Barrels, which open and close gates that block the Kongs' path respectively, make their only appearance in this level. As such, the heroes should hit every Check Barrel they come across and avoid all X Barrels, for if an X Barrel is hit, the next gate closes and blocks their path, which will take out either Kong. Klanks make their first of two appearances here, in addition to the regular Zingers and Flitters. The music in this level, as well as the music from other amusement park-themed levels, is called "Disco Train." The primates ride up a large hill. At the start of the level, the heroes can find a pathway over a wooden tunnel that they must travel across to reach an Auto Fire Barrel. The barrel can shoot them into a Roller Coaster. The cart begins to move as soon as they land on it, and then travels a short distance east, where there are some enemies. Shortly after riding down a large hill, the heroes drive towards a Zinger above a lower track. The track curves into a small hill ahead of here and leads the hero towards a tunnel that contains a hidden Golden Feather. A Flitter is above the track near here that can bounce the primates to the letter K. A barrel with a check mark on it is immediately after the tunnel, opening the gate that follows. Once they get through this gate, they travel over a large hill and cross over a gap. They must hop out of their cart at the gap so they can access the second Roller Coaster waiting at the other end of the abyss. This cart leads them to a second gate. A check marked barrel is immediately before it that can open it, but the primates must bounce on a Flitter to hit it. After this gate, the Kongs ride up and down some hills and soon meet a Klank riding ahead. The Klank drops off the track shortly after they find it, but it manages to hurl a barrel at them before falling. A check marked barrel is above the gap that it falls in, opening the next gate, which they must go through. This is shortly after followed by the fourth gate. This door is already open, and they need to avoid hitting the X Barrel immediately before it to continue safely. A large hill is after the gate, followed by some more small hills. As they ride over the hills, they approach a Bonus Barrel that is placed in the air. A gap follows here with another Roller Coaster at the other side of it. The cart leads them to the letter O, as well as towards a pair of Flitters that can be bounced on to reach another check marked barrel. A gate ahead is opened when it is hit. On the other side of the gate, the heroes ride towards another gap, which has a Flitter in it. There is an additional Roller Coaster waiting at the other side of the gap. The Star Barrel floats above it. Two open gates with a DK Barrel between them follow the Star Barrel. Two small gaps are ahead, and a Roller Coaster sits at the other side of each abyss to drive the Kong forward. After the second abyss, they land in a cart that rides them towards an X barrel that they must jump over to ride under another open gate. This gate is followed by two more gates, which have check marked barrels to open them. The first barrel is surrounded by a Zinger, while the second one is after a gap following it. They pass the letter N on the way between these gates. After this, the group travels up and down a large hill and rides through a small tunnel, which contains a hidden DK Coin. Upon exiting, a Klank appears, who throws barrels at them. The Klank soon falls into a small gap, which has a check marked barrel near it. The barrel must be hit to open a nearby gate. There is an additional gate shortly ahead, but it is already open. While trying not to jump into a Zinger, they must jump over an X marked barrel to keep it open so they can drive through safely. The Kongs ride towards a closed gate. After another gap ahead of this, the Kongs ride down a large hill and, on the way, find a check marked barrel near a Zinger. The heroes approach a large gap once they pass this gate. They must bounce on Flitters to cross it and reach the next cart. This cart leads them towards a gate, which must be opened with a check marked barrel found in the air between two Zingers. Another check marked barrel is ahead in an abyss. The primates must drop into the abyss and jump out of their cart to grab it safely. Once they hit the barrel, they can land back in a Roller Coaster waiting on the track and ride through the now-opened gate. Finally, the heroes approach another X marked barrel as they ride ahead. They must jump over it to keep the gate following it open to pass through. A tunnel is after the gate that leads the Kongs into a small area, where they find themselves on foot again. The End of Level Target is just ahead of here, and once it is hit the level is completed. A prize can be won from landing on the target if the heroes shoot to it from a nearby Barrel Cannon. K: After passing the first Zinger, the heroes ride up a hill towards a Flitter that they can bounce on to reach the letter K.
O: Shortly before the reaching Star Barrel, the Kongs must bounce on a pair of Flitters to reach a check marked barrel. The letter O is right before these Flitters in the air. N: After the primates ride past the first X marked barrel after the Star Barrel, their cart should ride them towards another gate that can be opened with a check marked barrel. The letter N is before a gap in the air soon after this gate. G: The letter G is located before an Auto Fire Barrel at the exit of the second Bonus Level. The primates jump between Skull Carts in the second Bonus Level. Shortly after the Kongs dodge the first Klank, they head through a pair of gates and then approach a Bonus Barrel floating in the air. Before reaching the bottom of the hill just before this barrel, the heroes must jump to land in the Bonus Barrel. The barrel leads to a Bonus Level, where they find themselves in a bramble area. At the beginning of the area, they can discover Squawks the Parrot, who must help them by lifting them into the area around the brambles. Nine Zingers are scattered throughout this area, and all of them must be defeated with Squawks's nuts in order to make a Kremkoin appear at the exit of the bonus. A No Animal Sign is located at the end of the area next to the coin, and if it is reached, Squawks disappears and a Banana Bunch appears nearby. The primates are sent out of the Bonus Level without a Kremkoin if they hit any brambles or enemies, or if they take more than 30 seconds to collect the coin. Near the end of the level, the Kongs meet the second Klank, who eventually falls into a small gap. The heroes must follow it into the gap to discover a hidden track that leads them into a tunnel. Upon entering this tunnel, they are sent into a Bonus Level, where they must travel through another amusement park area to find a Kremkoin at the end of it. On they way, they come up to many small gaps and many additional Roller Coasters. They must reach and collect the Kremkoin within the time limit of 15 seconds. If they fail to reach it in this time, or if they fall into a gap, they are sent back into the main level without it. Before the heroes make it to the second Klank, they travel through a tunnel. Here, they should jump to grab a hidden DK Coin. At the beginning of the level, the Kongs go through the first tunnel, which contains a Golden Feather. If they jump in the center of this tunnel, they can grab the item. The Kongs reach the bottom of a hill. 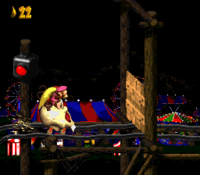 The Kongs ride behind a Klank in the Game Boy Advance version. This page was last edited on April 6, 2019, at 01:58.